With the US abandoning its role of world leader in fighting climate change, Germany is an ideal candidate. Spreading Germany’s successful energy policies could be crucial in saving the environment. "Synlight", a German renewable energy project. Image by DLR German Aerospace Center/Flickr. Some rights reserved.Angela Merkel has a lot on her plate: the refugee crisis, upcoming elections, the promotion of democracy, and the political crisis of the European. But there is another issue that she’ll have to add: leading the world in the fight against global warming. Under Trump’s administration, the US will no longer lead climate-related projects but instead cut $100 million worth of energy policies in its proposed budget. 1. Germany’s Renewable Energy Sources Act (EEG) gives renewables priority. In 2000, the EEG, the act that promotes renewable energy sources, came into effect and it has been renewed several times since. It ensures that investors in renewable energy receive compensation irrespective of electricity prices, a so-called feed-in tariff. In the renewed 2014 version, deployment corridors for plant operators will stipulate expansion of renewable electricity and funding rates will be determined by auction. The EEG has turned renewables into the most important source of electricity in Germany. In 2017, renewables made up just over 41% of Germany’s power supply. In 2017, renewables made up just over 41% of Germany’s power supply. 2. Germany is replacing nukes and fossil fuels with wind and solar technology. Wherever you are in the country, you will see solar panels on buildings and wind turbines and farms constituting landscapes and offshores. While Germans might not like the appearance of the manufactured devices in their landscape, they support environmental awareness. The technologies supply clean energy and reduce reliance on fossil fuels with the goal of crowding out coal. Since the 2011 accident at Fukushima’s nuclear reactor, Germany started to dismantle all its remaining 17 nuclear plants. By 2022, all reactors should be decommissioned by the government. The gaps in energy supply of the nuclear phase-out are instead filled through renewables, gas turbines, and conservation. 3. Germany continues to invest in new technology. 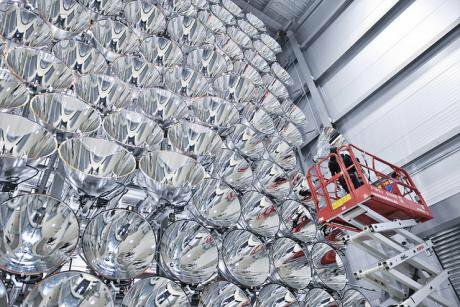 Just a few weeks ago, Germany switched on the world’s largest artificial sun. Scientists hope to generate climate-friendly fuel from the intense light source. The produced intensity is 10,000 times more than natural sunlight on earth. E.ON, a major German energy company, invests in airborne wind energy, an emerging sector developing game changing technologies. The company is cooperating with Netherlands-based Ampyx Power to develop a test site of the new technology in Ireland. Germany also invests heavily in a transition in the transportation sector. New funding worth €130 million is used to link innovative energy technologies with maritime science and research into low-carbon and low-emission combustion engines and alternative electricity-based fuels. The country is leading among all members of the Organisation for Economic Co-operation and Development. 4. Germany is winning the recycling race. Germany recycles 45% of all materials and 65% of all municipal waste. According to Forbes, the country is leading among all members of the Organisation for Economic Co-operation and Development. To some extent, this can be attributed to the high bottle deposits, that range from 7 to 25 cents, but German citizens play an important role in the success story too. They don’t only recycle heavily but they have also reduced their daily drinking water consumption from 144 litres to 121 litres, the second lowest rate of all industrialized countries. National environmental awareness includes pure air and clean waterways as preconditions for a high quality of life. That’s why everyone becomes a part of the fight against climate change. No other country has established such an environmental revolution. Germany should stop being inward-looking, but pass on experience, knowledge, and environmental awareness. The country is careful to promote its energy policies to avoid clashes, especially with the new US administration. But no other country has established such an environmental revolution - Energiewende. Scientists believe that all nations have to complete a similar transformation if humanity wants to avert a climate disaster. Germany entered into an energy partnership with Morocco in 2012, which helped fund one of the world's largest solar power station in Ouarzazate, in south-central Morocco. Such partnerships and support are desirable and necessary to slow and stop global warming. It looks like Chancellor Merkel will have to add environmental outreach to her to-do list.